Kostyk, John Howard-sadly, after a lengthy illness we lost our beloved husband, and father on March 28, 2019, in Comox, BC. Jack was born on December 21, 1943, in Winnipegosis, Manitoba, to parents Fred and Tina Kostyk, their third of seven children. The family lived in Duck Bay, Manitoba, at the time, but relocated to The Pas, Manitoba, where Jack grew up. He attended most of his schooling in The Pas, and graduated from The Pas Collegiate. Jack was a proud member of the Air Cadets in The Pas and had a lifelong interest in aviation. He attained his private pilot’s license in the 80’s. After graduation Jack took further trades courses at Red River College, in Winnipeg, and became a welder and an apprentice plumber, in 1963. 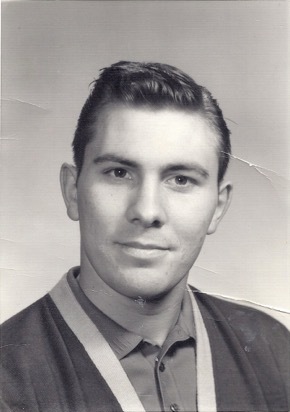 He worked for Service Plumbing in The Pas prior to moving to Thompson with his wife Barbara Kostyk (nee Stephens) whom he married in April of 1966. Jack worked for Malcolm Construction from 1963-1972 helping build Thompson into the mining community it became by working on projects such as the T-3 Mine, SOAB North and South, the Copper Dry project, and T-1 Propane Farm. In 1972 Jack formed his own company, Jax Mechanical Services Limited, and was mostly a one-man operation doing commercial and residential plumbing, heating and sheet metal mechanical work. One job he once undertook was to do maintenance on various microwave towers for MTS. This involved climbing up small towers, some of which were 500-600 feet high. Jack took it all in stride. Jack also worked for a time as Maintenance Director of the Thompson Hospital, and clerk of the works for the Burntwood Regional Heath Authority new Health and Family Services Building project and clerk of the works for the arena renovation project for the City of Thompson. He retired in 2006 and moved to Comox, BC in 2007. He was very proud of having exacting high standards for his own work and any of the work that he supervised. He always wanted to ensure that the customer got what s/he had paid for and accepted nothing less. Jack enjoyed living and working in Thompson for over forty years and was always proud that his family grew up there. Father to Carolyn and Richard, Jack built a home on Notigi Bay for the family in the late 70’s and also built a house for himself and Barb on Manasan Drive, one for Carolyn’s family on Mitishto Bay, and one for Richard in The Pas. Jack served the Thompson community in many capacities including coaching hockey and lacrosse, various election committees, United Church committees and other charitable causes. He was an avid racquetball player, marathon runner, and outdoorsman who hunted, fished, picked berries, cut wood and just generally enjoyed exploring the outdoors. He was a loving and devoted husband to Barbara and the two travelled to Hawaii, Cuba and the southern U. S. and after he retired in 2006, he spent much time in The Pas at the cottage he built at Clearwater Lake entertaining their children and grandchildren during the summer months. Jack loved his three grandchildren Aiden Halcrow, Luc, and Michelle Kostyk deeply and enjoyed spending time with them in the water, boating, fishing, building and gardening at Clearwater Lake and a large shop he built at Watchi Bay. He leaves his wife Barbara and daughter Carolyn Halcrow of Comox, BC; son Richard (Monique Levesque) of The Pas; grandchildren Aiden Halcrow of Thompson, Manitoba, and Luc and Michelle Kostyk of The Pas, MB; sisters Elaine (Al) Fogh, Sherwood Park, AB and Carol (Tom) Heape, The Pas; brothers Larry, Ken (Karen) and their families of The Pas, MB. He also leaves nephews and nieces, including Kelly Heape, Kim Hoffman, Liana Steiner, Stewart Fogh, Rhena Kostyk, Daniel Kostyk, Tiffany Kostyk, Samantha Kostyk, Tina Garton, Wade Dube, Colleen Weinstein, Shawn Stephens and Chris Stephens. Also missing Jack will be in-laws Linda and Bernard Dube, Jack and Karen Stephens, and aunts Mae Derkacz, Ethelyne Kostyk and friends across Canada. He was predeceased by both his parents and his parents-in-law, infant brother Richard, sister Shelley Garton, brother-in-law Brian Garton, nephew James Kostyk and dear aunt and uncle Louella and Mike Tabak. Flowers gratefully declined. Donations made to the Canadian Cancer Society or charity of your choice would be greatly appreciated. A simple celebration will be held on Wednesday, April 10, 2019, at 11:00 am at Comox Valley Funeral Home, Cremation and Reception Centre, 1101 Ryan Road, Courtenay. Cremation has taken place. There will be a commemoration held in The Pas, Manitoba, summer of 2019.